Cost 5gp and obtained (when available) from any good alchemist. 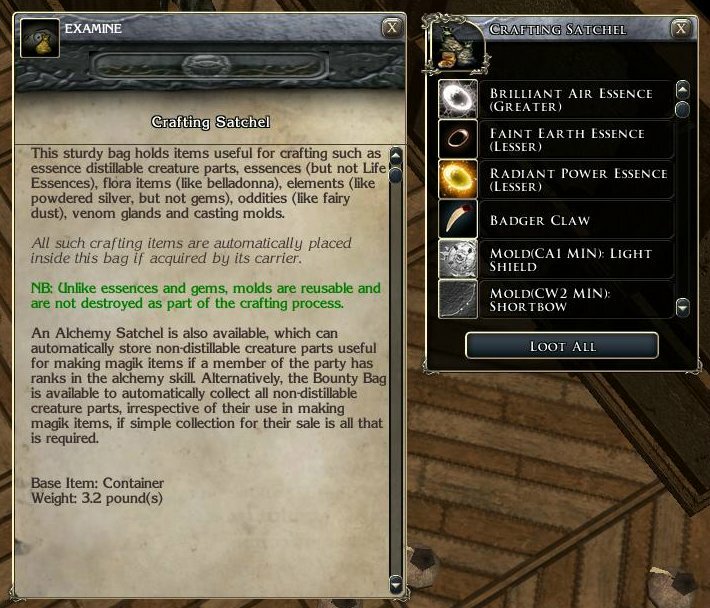 The first tome, entitled Crafting Recipes From The Past, covers every crafting recipe that came with the first official campaign, with many recipes covering the lesser essences and gems. Not every recipe included in this tome requires such, but if it was a recipe that was detailed in a book from the first official campaign, then this tome has it covered. 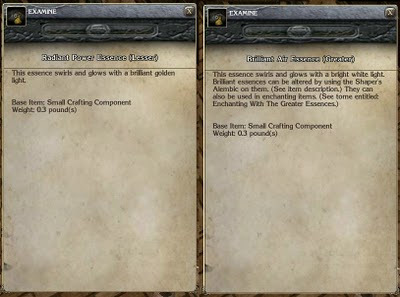 The second tome, entitled Crafting With The Greater Essences, does the same thing of amalgamating all the recipes into one book, but for those recipes that were found in the second official campaign, Mask of the Betrayer. 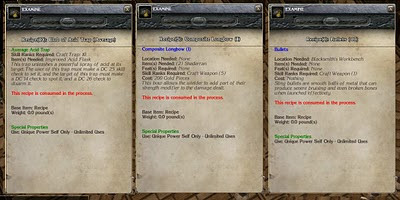 The beauty of this, is that the player no longer has to hunt around trying to locate the recipe they need among the many books, or struggle to recall what it is they need to have to qualify, as all the details have been carefully laid out in such a way to make finding a valid and useful recipe reasonably quickly. It is even possible to easily consider a plan of enhancement or creation ahead of time because the crafter has all the relevant details to hand. 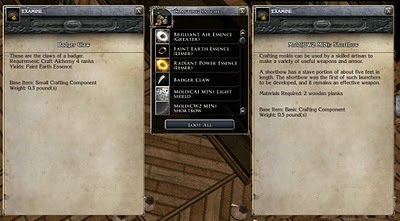 Finally, with the introduction of Storms of Zehir, the player was introduced to a third recipe system. Thankfully, this system introduced recipe books straight away, and so the newer recipe system complements the two described here well. However, I have made one distinction of the newer recipes, and that is they act more like magikal pages that are used up when they are used to help enhance or create an item. Therefore, the modern recipe books can hold more than one copy of the same recipe, simply because you need a separate copy of the recipe for each time you wish to carry out its formula. 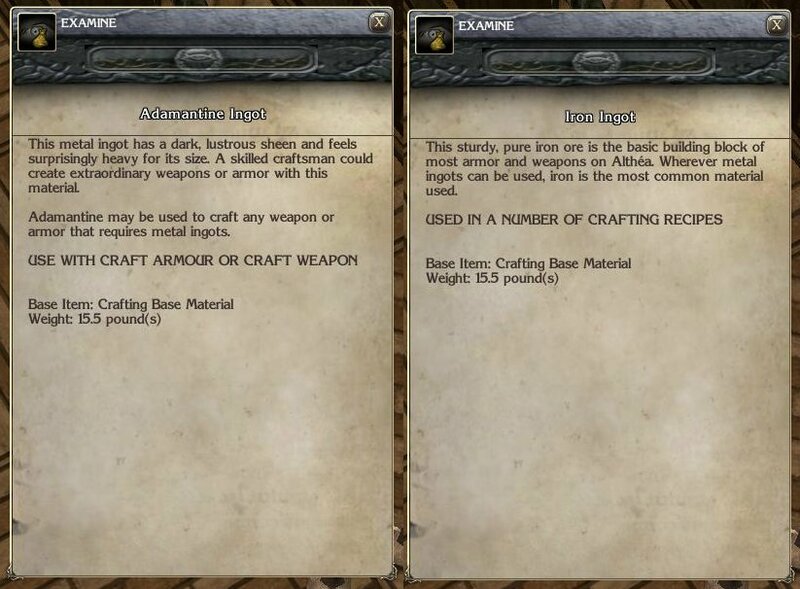 The entire crafting scripts have undergone comprehensive changes to help iron out many of the differences and inconsistencies between them, which I will mention in a minute. I have also edited many cost related 2da files to ensure crafted items do not upset the economy of the world and reflect sensible values between ingredients used and final product. I have even fixed one or two broken recipes along the way. 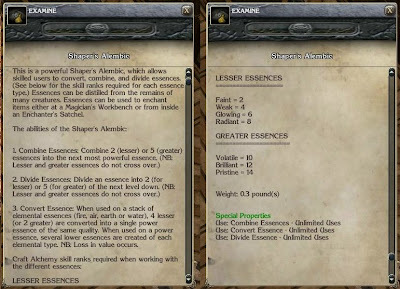 Notice how the essence description is not the source of the information for what it can do. 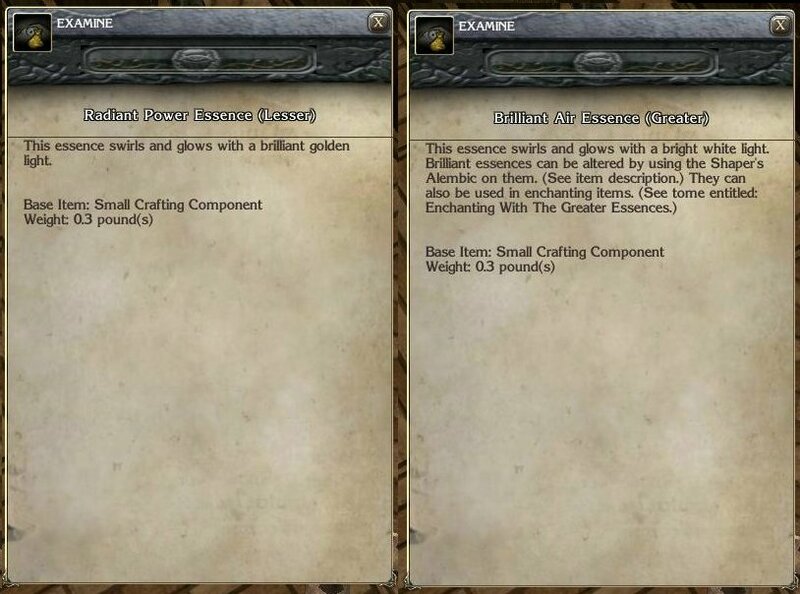 To find this information, you simply look up the recipe you wish to follow within the Crafting With The Greater Essences tome. The logic is you look for and plan what you want to create from reading the tome (or any tome) and then look out for the ingredients required. You decide what to make rather than see what can be made from the essence. As an important aside, you must carry a copy of these tomes to be able to use any of the recipes within them. In other words, you cannot meta-game the recipes by referring to them outside of the game and then playing them out in the game. The Alchemists' Satchel (cost 2gp and readily available from any good alchemist) is more useful to PC's who have the skill to determine creature parts that can be used in modern recipes (as opposed to creature distillable parts used to create the lesser essences). 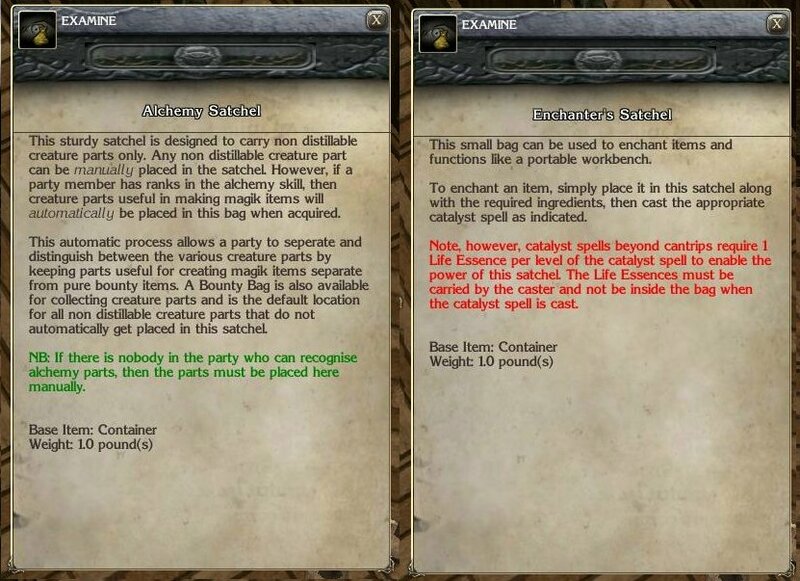 If the PC has taken the time to increase their alchemy skill, then any creature parts they find that can be used in modern recipes will be instantly recognised and placed into this satchel if carried. These parts are automatically used if and when a PC uses a modern style recipe. The second bag is the more expensive Enchanter's Satchel, costing 100 gp and obtained (when available) from any good Alchemist. Once the crafter has established themselves and gold becomes less of an issue, then purchasing an Enchanter's Satchel is the way to go to avoid having to go back to a known bench location whenever they need to do some crafting involving a magician's workbench. It does require the power of Life Essences though to help enable its magik in the field. Next up are the Mortar & Pestle and the Smith's Hammer: two very useful tools of the trade for any would be crafters. If alchemy is more your craft, then the mortar & pestle will be your first tool of the trade, costing around 4 gp and obtained from any good alchemist or local sundry store. 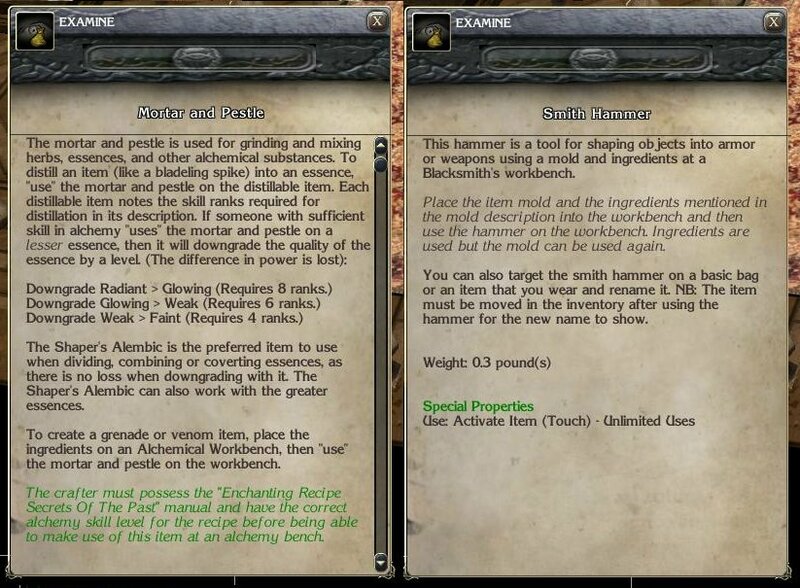 On the other hand, if working with molds to create your own armour and weapons is more your thing, the you will need to pick up a smith hammer, also costing around 4 gp from a smith or local sundry store. 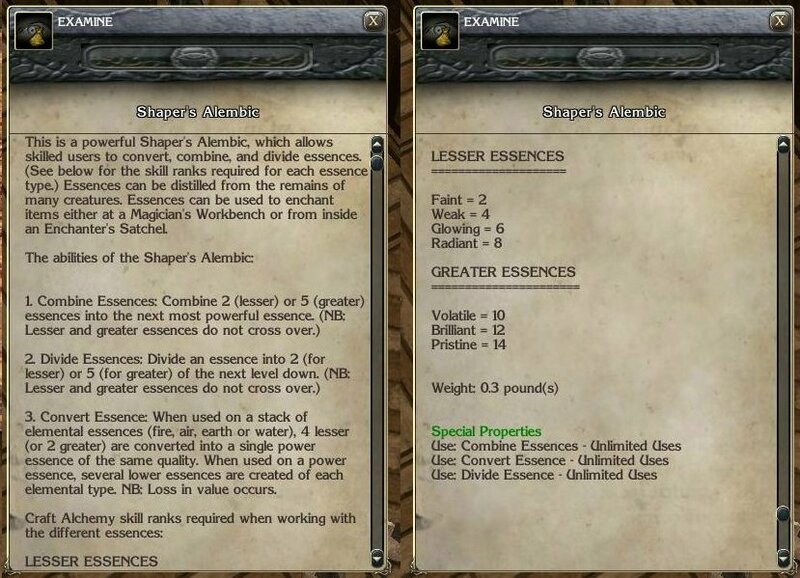 The most expensive tool a crafter is likely to purchase is a Shaper's Alembic; a tool designed to convert, combine or divide essences, costing around 320 gp and normally only one or two available at a time from an alchemist due to their expense. They become a much more viable tool at higher levels and when the crafter really needs to work with essences more effectively. Note from the description, however, that all the information about skill ranks is known ahead of time and that the tool handles all essences that can be found at much lower levels than any previous campaign has allowed, making the whole system easier to get into. Finally, take a look at some of the modern recipes available in the screenshots below. 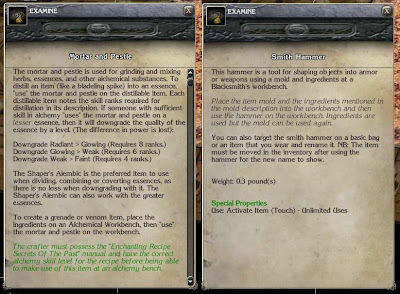 Notice (like the molds name) that these recipes include a number in their name title if the PC needs to meet a minimum caster level (for enchanting) or rank in a skill (for creating). 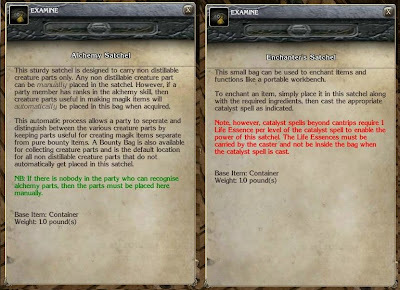 This makes it it as easy as a glance to quickly look at the recipe name and determine if you are of high enough ability to even be able to attempt the crafting without having to look at the further details. Scrolling through the recipes available in a book will be all it takes to quickly work out if you have anything within your capabilities. You can even see from the names in these examples, that the Amulet of Health (+2) does not have a minimum figure, which means only the feat is required. 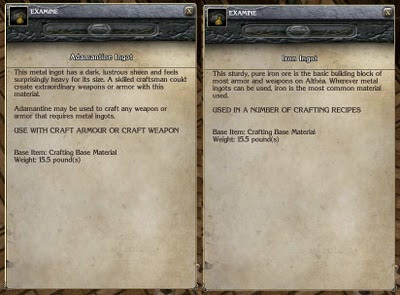 One of the major problems with the different crafting systems was that they all had their own idiosyncrasies about how to add properties and what would or would not count as a property already. For example, in some systems adamantine weapons counted as having enhancements already, whereas in another, they did not count. In Better The Demon, all this has been ironed out and it a very simple case now of all weapons and armour can have a maximum of 4 magikal properties - excluding any material benefits! (*) Therefore, whether a weapon is made from adamantine or iron, both weapons can have four more properties added. The added benefits of an adamantine item are just that - additional benefits! Therefore, the system does not penalise for characters improving items created from the more exotic materials, but even enhances them further! This maximum is across the board for items, be they weapons or armour, etc. The only exception to this maximum is if the weapon is of poorer quality (a new gaming system in Better The Demon), in which case, a weapon may only hold one or two properties, or the poorest quality weapons none at all! Furthermore, it is possible for weapons to degrade if not cared for, and if they drop a level in quality, they could potentially lose a magikal property as well. Note, however, weapons cannot lose their material properties, which adds value to weapons made from exotic materials, as even the poorest quality weapons of such materials can offer benefits. (*) Items other than weapons and armour are also set to four, but are subject to any restrictions they may have in the official rules. Furthermore, all items can have a property upgraded even if all four property slots have been filled! 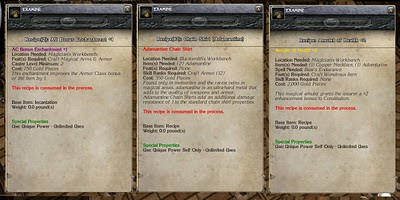 In previous systems, property slots had to be "left open" to allow a property to potentially be upgraded if a higher value magikal property recipe was found. Now, for example, if you have an item with all four slots filled and you find a recipe that can improve a weapon's AC protection from +1 to +2, you can replace the old property without any problem. This maximum number of properties and ability to upgrade an existing property is valid across any and all systems of crafting. Therefore, irrespective of which crafting system you may have adopted and used in the past, you should find it very easy to fit within the new single amalgamated system, using whichever recipe formula you have available to you at the time: be it acquiring and working with the lesser essences and gems, or obtaining the greater essences or even finding modern recipes - all of them work together to either improve existing items or allow you to create better ones. To keep track of the number of slots available, the information is given to the player as a message each time they acquire, equip or unequip the item. Finally, I would like to just mention (as a side topic to crafting) that these three creation feats have taken on greater strength and ease of use in Better The Demon as well. 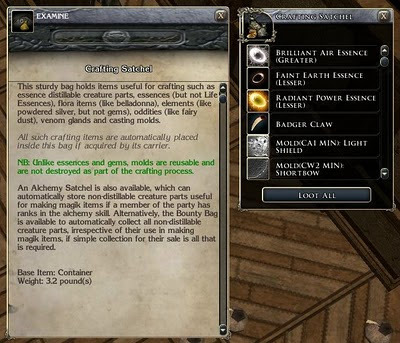 The PC now has much more control over the power of such a creation, being given the option to upgrade the power of the item at time of creation. Scrolls, in particular, have the added benefit of automatically increasing in power along with the strength of the user. e.g. If a PC found a Magic Missile scroll at 1st level and cast it, it would release a level 1 missile. If, however, the PC did not use the scroll until they had reached 5th level, then the same scroll would cast as a 5th level Magic Missile. The idea of all these additions to the existing systems is to a) Make it easier for the player to use the system and b) Make the feats worth learning and using. As an addition, it is cheaper for a PC to create their own potions using the Brew Potion feat (or scroll or wand using the appropriate feat) than purchasing one. Therefore, they are immediately rewarded for their new found feats and could, potentially, even earn a few gold creating and selling these items along the way. Blank scrolls cost 1 gp, potion bottles cost 3 gp and bone wands cost 10 gp where stock is available. I'm speechless :) A massive post and a massive effort to make crafting both easy and more interesting. I like it. That is the goal, to make crafting more accessible than it is at the moment. I always felt the problem was two-fold: 1) Crafting felt too involved and was somewhat esoteric and 2) Items that could be crafted were generally plentiful from traders in teh first place - so why bother crafting them? Hopefully, my own approach will address both of these issues. Primarily, crafting materials will be available from the start (for only a few gold or easily acquired) and the items they make will not be so readily available. Therefore, if you want to get a good weapon (or any particular item) fairly quickly, then you (the PC) has to do I little crafting. The point is though, it will be easier to do and less restrictive than the past. I hope this will appeal to many gamers if they give it a try. More seriously, I like the look of this. It looks like you've fixed the mess of the official crafting system--haha, hence the reason I created my own--and made it compatible with a logical, reasonable system. Kudos! I'm glad you like it. :) I did consider revising a new system, but gradually found myself simply "fixing" the current ones available. In the end, I made some design decisions about it, and decided to create the system you now see. It works alongside my other systems well, and remains fairly consistent with what people may have already been used to, but with added ease of use.